The exhibition ‘Cat Love. Nine lives in the arts’ shows how cats have been depicted by artists since the second half of the nineteenth century. Both young and old visitors can find out what it’s like to be a cat by creeping and purring their way through this interactive exhibition. Seven cabinets will highlight different aspects of the cat. From the seductive cats that captivated French artistic circles in 19th-century Paris as symbols of the city’s vibrant nightlife, to cats living the good life while purring and sleeping through each of their nine lives. The rebellious cats we know from the numerous slapstick-like videos that are massively liked on the internet are also featured in the exhibition. A large collection of posters and illustrations shows that cats are often symbolic of femininity and elegance. 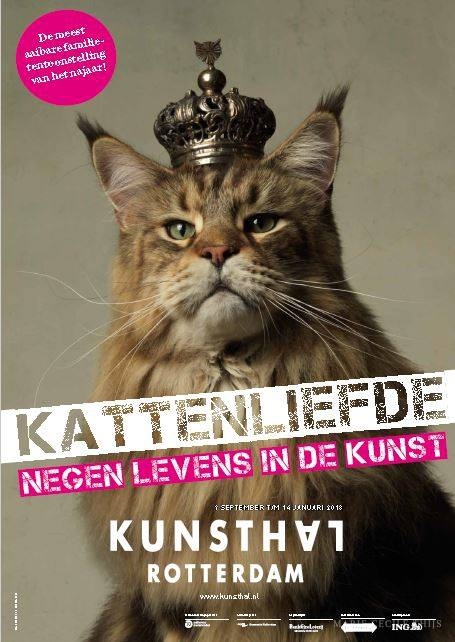 The exhibition presents masterpieces by Henriëtte Ronner-Knip, Théophile-Alexandre Steinlen, Karel Appel, Picasso and Wallasse Ting as well as work by contemporary artists such as David Shrigley and the majestic cat photos of Marie Cécile Thijs. This varied selection of artworks offers an insight into the role cats have played in art and explores what make cats so attractive.